Abu Musab al-Zarqawi (Arabic: أبو مصعب الزرقاوي‎, ’Abū Muṣ‘ab az-Zarqāwī, Abu Musab from Zarqa; English pronunciation (help·info); October 30, 1966 – June 7, 2006), born Ahmad Fadeel al-Nazal al-Khalayleh (أحمد فضيل النزال الخلايلة, ’Aḥmad Faḍīl an-Nazāl al-Ḫalāyla), was a Jordanian jihadist who ran a paramilitary training camp in Afghanistan. He became known after going to Iraq and being responsible for a series of bombings, beheadings, and attacks during the Iraq War, reportedly "turning an insurgency against US troops" in Iraq "into a Shia-Sunni civil war". He was sometimes known as "Sheikh of the slaughterers". Abu Musab was a sturdy man who was not really very good at words. He expressed himself spontaneously and briefly. He would not compromise any of his beliefs. Ahmad Fadeel al-Nazal al-Khalayleh (Arabic: أحمد فضيل النزال الخلايلة‎ ’Aḥmad Faḍīl an-Nazāl al-Ḫalāyla), is believed to have been al-Zarqawi's real name. "Abu Musab" literally translates to "Musab's father", born in the name Ahmed al-Khalayleh to an impoverished Palestinian-Jordanian family in 1966. He was raised in Zarqa, an industrial town located 27 kilometers (17 mi) north of Amman. Zarqawi is reported as having been a high school dropout and a petty criminal in his youth, including, allegedly, a procurer of prostitutes. In the late 1980s, Zarqawi went to Afghanistan to join the Mujahideen who were fighting the invading Soviet troops. Arriving there in 1989, the Soviets were already leaving. Instead of fighting, he became a reporter for an Islamist newsletter called Al-Bonian al-Marsous. He was recruited by Abu Qutaibah al Majali to fight in Afghanistan. According to a report by The Washington Institute for Near East Policy, "Zarqawi's criminal past and extreme views on takfir (accusing another Muslim of heresy and thereby justifying his killing) created major friction and distrust with bin Laden when the two first met in Afghanistan in 1999." When Pakistan revoked his visa, he crossed into Afghanistan, where he met, still according to Jordanian officials and also German court testimony, with Osama bin Laden and other al-Qaida leaders in Kandahar and Kabul. He asked them for assistance and money to set up his own training camp in Herat. With some "small seed money" of $200,000 from Osama bin Laden, the camp opened soon and attracted Jordanian militants. That camp was either for his group Jund al-Sham—as one, indirect, source contended—or for his newly started group Jama'at al-Tawhid wal-Jihad—as the Washington Institute for Near East Policy claimed—or he started one or two camps for both of those groups in Herat in 1999. It is also possible that Zarqawi set up only one camp for only one group known by those two different names in 1999. GlobalSecurity.org called it "a camp near Herat, reportedly specialised in manufacturing poisons". After the October 2001 U.S.-led invasion of Afghanistan, Zarqawi returned in Afghanistan to help repel the assault by western allied forces, joining with Taliban and al-Qaida fighters. He either suffered cracked ribs following the collapse of a bombed house or, according to a Jordanian intelligence source, was wounded in the chest during a firefight, in late 2001. He fled to Iran in December 2001 or January 5, 2002 and received medical treatment in Mashhad. The Iranian government reportedly refused Jordanian requests to extradite Zarqawi. Circumstantial evidence suggests that Iranian authorities may have restricted Zarqawi's activities to some extent. By, and during the summer of 2002, Zarqawi's location and activities appear in reports that conflict with one another. In 2004, Jordanian court documents said that Zarqawi, during this summer, began training a band of fighters at a base in Syria, which group on October 28, 2002 shot and killed Laurence Foley, U.S. senior administrator of U.S. Agency for International Development in Amman, Jordan. According to Arab intelligence sources in 2004, Zarqawi was still in Syria late in 2002, when U.S. and Jordan requested his extradition from Syria, which Syria refused. Over 2003–2006, Zarqawi and his group Jama'at al-Tawhid wal-Jihad (1999–2004) later called Tanzim Qaidat al-Jihad fi Bilad al-Rafidayn ('al-Qaeda in Iraq') (2004–2006) are accused of dozens of violent and deadly attacks in Iraq, which had, after the March 2003 U.S.-led invasion of Iraq, fallen into chaos and anarchy. Some of these attacks Zarqawi indeed claimed responsibility for, as well as for some attacks in Morocco, Turkey and Jordan, and some foiled attacks in Turkey and Jordan, all listed in the section 'Attacks' below. Stephen Hayes wrote for the Weekly Standard, that March 2003 British Intelligence "reporting since (February)" suggests that before the invasion of Iraq, Zarqawi ran a "terrorist haven" in Kurdish northern Iraq, and that Zarqawi had set up "sleeper cells" in Baghdad, "to be activated during a U.S. occupation of the city... These cells apparently intend to attack U.S. targets using car bombs and other weapons. (It is also possible that they have received [chemical and biological] materials from terrorists in the Kurdish Autonomous Zone), ... al Qaeda-associated terrorists continued to arrive in Baghdad in early March." Later on, it was discovered that other careful reporting by Stephen Hayes had been incorrect- the biggest was about Zarqawi's prosthetic limb. When Zarqawi was killed it was evident he did not have a prosthetic limb as Stephen Hayes had reported in so much detail. The anti-war movement accused Stephen Hayes of having invented stories, and Loretta Napoleani, author of several books on terrorism, including Terror Incorporated, argued that the importance of Zarqawi was built on incomplete Kurdish intelligence and then fomented by the U.S. to make him the new face of al-Qaida. In May 2004, a video appeared on an alleged al-Qaeda website showing a group of five men, their faces covered with keffiyeh or balaclavas, beheading American civilian Nicholas Berg, who had been abducted and taken hostage in Iraq weeks earlier. The CIA confirmed that the speaker on the tape wielding the knife that killed Berg was al-Zarqawi. The video opens with the title "Abu Musab al-Zarqawi slaughters an American". The speaker states that the murder was in retaliation for U.S. abuses at the Abu Ghraib prison (see Abu Ghraib prison abuse scandal). Following the death of al-Zarqawi, CNN spoke with Nicholas' father and long-time anti-war activist Michael Berg, who stated that al-Zarqawi's killing would lead to further vengeance and was not a cause for rejoicing. The CIA also confirmed that Zarqawi personally beheaded another American civilian, Owen Eugene Armstrong, in September 2004. United States officials implicated Zarqawi in over 700 killings in Iraq during the invasion, mostly from bombings. Since March 2004, that number rose into the thousands. According to the United States State Department, Zarqawi was responsible for the Canal Hotel bombing of the United Nations Headquarters in Iraq on August 19, 2003. This attack killed twenty-two people, including the United Nations secretary general's special Iraqi envoy Sergio Vieira de Mello. Zarqawi's biggest alleged atrocities in Iraq included the attacks on the Shia shrines in Karbala and Baghdad in March 2004, which killed over 180 people, and the car bomb attacks in Najaf and Karbala in December 2004, which claimed over 60 lives. Zarqawi is believed by the former Coalition Provisional Authority in Iraq to have written an intercepted letter to the al-Qaeda leadership in February 2004 on the progress of the "Iraqi jihad". However, al-Qaeda denied they had written the letter. 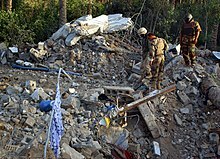 The U.S. military believes Zarqawi organized the February 2006 attack on the Al Askari Mosque in Samarra, in an attempt to trigger sectarian violence between Sunnis and Shi'ites in Iraq. According to The Washington Post and some other sources, he formally swore loyalty (Bay'ah) to bin Laden in October 2004 and was in turn appointed bin Laden's deputy. Zarqawi then changed the name of his Monotheism and Jihad network to Tanẓīm Qāʻidat al-Jihād fī Bilād al-Rāfidayn, which became commonly known as Al-Qaeda in Iraq (AQI). You, gracious brothers, are the leaders, guides, and symbolic figures of jihad and battle. We do not see ourselves as fit to challenge you, and we have never striven to achieve glory for ourselves. All that we hope is that we will be the spearhead, the enabling vanguard, and the bridge on which the Islamic nation crosses over to the victory that is promised and the tomorrow to which we aspire. This is our vision, and we have explained it. This is our path, and we have made it clear. If you agree with us on it, if you adopt it as a program and road, and if you are convinced of the idea of fighting the sects of apostasy, we will be your readied soldiers, working under your banner, complying with your orders, and indeed swearing fealty to you publicly and in the news media, vexing the infidels and gladdening those who preach the oneness of Allah. On that day, the believers will rejoice in Allah's victory. If things appear otherwise to you, we are brothers, and the disagreement will not spoil our friendship. This is a cause in which we are cooperating for the good and supporting jihad. Awaiting your response, may Allah preserve you as keys to good and reserves for Islam and its people. Numerous messages were passed between 'Abu Musab' (Allah protect him) and the al-Qaeda brotherhood over the past eight months, establishing a dialogue between them. No sooner had the calls been cut off than Allah chose to restore them, and our most generous brothers in al-Qaeda came to understand the strategy of the Tawhid wal-Jihad organization in Iraq, the land of the two rivers and of the Caliphs, and their hearts warmed to its methods and overall mission. Let it be known that al-Tawhid wal-Jihad pledges both its leaders and its soldiers to the mujahid commander, Sheikh 'Osama bin Laden' (in word and in deed) and to jihad for the sake of Allah until there is no more discord [among the ranks of Islam] and all of the religion turns toward Allah... By Allah, O sheikh of the mujahideen, if you bid us plunge into the ocean, we would follow you. If you ordered it so, we would obey. If you forbade us something, we would abide by your wishes. For what a fine commander you are to the armies of Islam, against the inveterate infidels and apostates! According to experts, Zarqawi gave al-Qaeda a highly visible presence in Iraq at a time when its original leaders went into hiding or were killed after the September 11, 2001 terrorist attacks in the United States. In turn, al-Qaeda leaders were able to brand a new franchise in Iraq and claim they were at the forefront of the fight to expel U.S. forces. But this relationship was proven to be fragile as Zarqawi angered al-Qaeda leaders by focusing attacks on Iraqi Shias more often than the U.S. military. In September 2005, U.S. intelligence officials said they had confiscated a long letter that al-Qaeda's deputy leader, Ayman al-Zawahiri, had written to Zarqawi, bluntly warning that Muslim public opinion was turning against him. According to Paul Wilkinson, chairman of the Center for the Study of Terrorism and Political Violence at the University of St. Andrews in Scotland, "A number of al-Qaeda figures were uncomfortable with the tactics he was using in Iraq ... It was quite clear with Zarqawi that as far as the al-Qaeda core leadership goes, they couldn't control the way in which their network affiliates operated." Iraq today harbors a deadly terrorist network headed by Abu Musab Al-Zarqawi, an associate and collaborator of Osama bin Laden and his Al Qaeda lieutenants. When our coalition ousted the Taliban, the Zarqawi network helped establish another poison and explosive training center camp. And this camp is located in northeastern Iraq. He traveled to Baghdad in May 2002 for medical treatment, staying in the capital of Iraq for two months while he recuperated to fight another day. During this stay, nearly two dozen extremists converged on Baghdad and established a base of operations there. These Al Qaeda affiliates, based in Baghdad, now coordinate the movement of people, money and supplies into and throughout Iraq for his network, and they've now been operating freely in the capital for more than eight months. We asked a friendly security service to approach Baghdad about extraditing Zarqawi and providing information about him and his close associates. This service contacted Iraqi officials twice, and we passed details that should have made it easy to find Zarqawi. The network remains in Baghdad. First of all, I don't think the two ideologies go together, I'm sure the former Iraqi leadership saw no interest in contacting al-Zarqawi or al-Qaeda operatives. The mentality of al-Qaeda simply doesn't go with the Ba'athist one. When he was in prison in Jordan with Shubaylat, Abu Mos'ab wouldn't accept me, said Shubaylat, because I'm opposition, even if I'm a Muslim. How could he accept Saddam Hussein, a secular dictator? Sensitive reporting indicates senior terrorist planner and close al Qaeda associate al Zarqawi has had an operational alliance with Iraqi officials. As of October 2002, al Zarqawi maintained contacts with the IIS to procure weapons and explosives, including surface-to-air missiles from an IIS officer in Baghdad. According to sensitive reporting, al Zarqawi was setting up sleeper cells in Baghdad to be activated in case of a U.S. occupation of the city, suggesting his operational cooperation with the Iraqis may have deepened in recent months. Such cooperation could include IIS provision of a secure operating bases [sic] and steady access to arms and explosives in preparation for a possible U.S. invasion. Al Zarqawi's procurements from the Iraqis also could support al Qaeda operations against the U.S. or its allies elsewhere. Writing in 2015, nine years after his death, an anonymous author in the New York Review of Books describes al-Zarqawi as having been responsible for "turning an insurgency against US troops" in Iraq "into a Shia–Sunni civil war". Washington Post reporter Joby Warrick argues that al-Zarqawi was the founder of "the group that became ISIS". Among other things, Warrick believes al-Zarqawi expanded the already broad "parameters of violence" in Iraq and the Middle East. I believe he is fictitious. He is a knife or a pistol in the hands of the occupier. I believe that all three – the occupation, the takfir (i.e. the practice of declaring other Muslims to be heretics) supporters, and the Saddam supporters – stem from the same source, because the takfir supporters and the Saddam supporters are a weapon in the hands of America and it pins its crimes on them. The Americans were constantly saying that the mujahideen in Iraq were led by foreigners... So, the Iraqi insurgents went to Zarqawi and insisted that an Iraqi be put in charge. But as I saw in coming weeks, Zarqawi remained the insurgents' hero, and the most influential member of their council, whatever Nour/Rashid's position. And it seemed to me, based on snatches of conversations, that two cell leaders under him – Abu Rasha and Abu Ahmed [al-Kuwaiti] – might also be on the council. At various times, I heard my captors discussing changes in their plans because of directives from the council and Zarqawi. We almost took them out three months before the Iraq war started. We almost took that thing, but we were so concerned that the chemical cloud from there could devastate the region that we chose to take them by land rather than by smart weapons. The question was whether to bomb the poisons lab in the summer of 2002. We held a series of NSC meetings on that topic... Colin [Powell] and Condi [Condoleezza Rice] felt a strike on the lab would create an international firestorm and disrupt our efforts to build a coalition to confront Saddam... I decided to continue on the diplomatic track. When the video of the Berg beheading was released in 2004, credence was given to the claim that Zarqawi was alive and active. The man identified as Zarqawi in the video did not appear to have a prosthetic leg. Videos of Zarqawi aired in 2006 that clearly showed him with both legs intact. When Zarqawi's body was autopsied, X-rays revealed that his right lower leg was fractured. On June 8, 2006, NBC news and the Pentagon reported that the US Special Operations Group Delta Force had been responsible for killing Zarqawi. Pentagon officials have refused to say whether U.S. special operations forces participated in the al-Zarqawi operation Wednesday, but a comment Friday by President Bush suggested that some of the military’s most secretive units may have been involved on the ground. Speaking to reporters, Bush mentioned that among the senior officers he called to offer congratulations for killing Zarqawi was Army Lt. Gen. Stanley McChrystal, commander of Joint Special Operations Command, whose forces include the Army’s clandestine counterterrorism unit, Delta Force. According to a CNN report dated December 15, 2005, al-Zarqawi was captured by Iraqi forces sometime during 2004 and later released because his captors did not realize who he was. This claim was made by a Saudi suicide bomber, Ahmed Abdullah al-Shaiyah, who survived a failed suicide attack to blow up the Jordanian mission in Baghdad in December. "Do you know what has happened to Zarqawi and where he is?" an Iraqi investigator asked Mr. Shaiyah. He answered, "I don't know, but I heard from some of my mujahadeen brothers that Iraqi police had captured Zarqawi in Fallujah." Mr. Shaiyah says he then heard that the police let the terrorist go because they had failed to recognize him. U.S. officials called the report "plausible" but refused to confirm it. Zarqawi was killed in a targeted killing on June 7, 2006, while attending a meeting in an isolated safe house approximately 8 km (5.0 mi) north of Baqubah. At 14:15 GMT, two United States Air Force F-16C jets identified the house and the lead jet dropped two 500-pound (230 kg) guided bombs, a laser-guided GBU-12 and GPS-guided GBU-38 on the building located at 33°48′02.83″N 44°30′48.58″E﻿ / ﻿33.8007861°N 44.5134944°E﻿ / 33.8007861; 44.5134944. Five others were also reported killed. 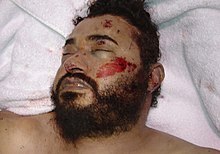 On June 8, 2006, coalition forces confirmed that Zarqawi's body was identified by facial recognition, fingerprinting, known scars and tattoos. They also announced the death of one of his key lieutenants, spiritual adviser Sheikh Abd-Al-Rahman. Zarqawi's brother-in-law has since claimed that he was a martyr even though the family renounced Zarqawi and his actions in the aftermath of the Amman triple suicide bombing that killed at least 60 people. The opinion of Iraqis on his death was mixed; some believed that it would promote peace between the warring factions, while others were convinced that his death would provoke his followers to a massive retaliation and cause more bombings and deaths in Iraq. A statement attributed to Abu Abdul Rahman "al-Iraqi", the deputy of al-Zarqawi, was released to Islamist websites, indicating that al-Qaeda in Iraq also confirmed Zarqawi's death, however Abu Abdul Rahman was killed during the same operation that killed al-Zarqawi. The online statement stated "We herald the martyrdom of our mujahed Sheikh Abu Musab al-Zarqawi in Iraq ... and we stress that this is an honor to our nation." A day before Zarqawi was killed, a U.S. strategic analysis site suggested that Zarqawi could have lost the trust of al-Qaeda due to his emphatic anti-Shia stance and the massacres of civilians allegedly committed in his name. Reports in The New York Times on June 8 treated the betrayal by at least one fellow al-Qaeda member as fact, stating that an individual close to Zarqawi disclosed the identity and location of Sheikh Abu Abdul Rahman to Jordanian and American intelligence. Non-stop surveillance of Abu Abdul Rahman quickly led to Zarqawi. The Associated Press quotes an unnamed Jordanian official as saying that the effort to find Zarqawi was successful partly due to information that Jordan obtained one month beforehand from a captured Zarqawi al-Qaeda operative named Ziad Khalaf Raja al-Karbouly. Zarqawi's death was seen as a major coup for the U.S. government in terms of the political and propaganda stakes. However, unconfirmed rumors in early April 2006 suggested that Zarqawi had been demoted from a strategic or coordinating function to overseer of paramilitary/terrorist activities of his group and that Abdullah bin Rashed al-Baghdadi of the Mujahideen Shura Council succeeded Zarqawi in the former function. 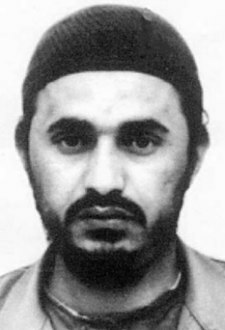 On June 15, 2006, the United States military officially identified Abu Ayyub al-Masri as the successor to Al-Qaeda in Iraq. By late 2007, violent and indiscriminate attacks directed by AQI against Iraqi civilians had severely damaged their image and caused the loss of support among the population, isolating the group. In a major blow to AQI, thousands of former Sunni militants that previously fought along with the group started to actively fight AQI and also work with the American and Iraqi forces, starting with the creation of the Anbar Awakening Council, so called because of its Anbar origins. The group spread to all Sunni cities and communities and some Shiite areas and adopted the broader name Sons of Iraq. The Sons of Iraq was instrumental in giving tips to coalition forces about weapons caches and militants resulting in the destruction of over 2,500 weapons caches and over 800 militants being killed or captured. In addition, the 30,000 strong U.S. troop surge supplied military planners with more manpower for operations targeting al-Qaeda in Iraq, The Mujahadeen Shura Council, Ansar Al-Sunnah and other terrorist groups. The resulting events led to dozens of high-level AQI leaders being captured or killed. Al-Qaeda seemed to have lost its foothold in Iraq and appeared to be severely crippled due to its lack of vast weapons caches, leaders, safe havens, and Iraqis willing to support them. Accordingly, the bounty issued for Abu Ayyub-al-Masri AKA Abu Hamza al-Muhajer was eventually cut from $5 million down to a mere $100,000 in April 2008. ^ Weiss, Michael; Hassan, Hassan (2015). "2, Sheikh of the slaughterers". ISIS: Inside the Army of Terror. Simon and Schuster. Retrieved October 29, 2015. ^ Chehab, Zaki 2006, Iraq Ablaze: Inside the Insurgency, IB Tauris & Co, Cornwall, p. 8. ^ "Al-Zarqawi declares war on Iraqi Shia". Al Jazeera. September 14, 2005. Retrieved October 22, 2009. ^ Filkins, Dexter; Burns, John F. (June 11, 2006). "At Site of Attack on Zarqawi, All That's Left Are Questions". The New York Times. ^ a b c Weaver, Mary Ann (July – August 2006). "The Short, Violent Life of Abu Musab al-Zarqawi". Atlantic Monthly. pp. 95–98. Retrieved May 6, 2011. ^ "Zarqawi and the 'al-Qaeda link'". BBC. February 5, 2003. Retrieved July 12, 2016. ^ Celso, Anthony (February 27, 2014). Al-Qaeda's Post-9/11 Devolution: The Failed Jihadist Struggle Against the Near and Far Enemy. Bloomsbury Publishing USA. ISBN 9781441180421. ^ Weaver, Mary Anne. "The Short, Violent Life of Abu Musab al-Zarqawi". The Atlantic. Retrieved November 13, 2016. ^ a b c d e f g h i j k l Whitlock, Craig (June 8, 2006). "Al-Zarqawi's Biography (page 2)". The Washington Post. Retrieved February 27, 2015. ^ Smith, Laura (June 8, 2006). "Timeline: Abu Musab al-Zarqawi". The Guardian. London. ^ Weaver, Mary Anne. "The Short, Violent Life of Abu Musab al-Zarqawi". The Atlantic. ^ From Muhammad to Bin Laden: Religious and Ideological Sources of the homicide bombers phenomenon, David Bukay. ^ Aftermath: Following the Bloodshed of America's Wars in the Muslim World, Nir Rosen. ^ The Search for Al Qaeda: Its Leadership, Ideology, and Future, Bruce Riedel. ^ the "islamic state" organization, hassan abu hanieh and mohammad abu rumman. ^ a b c 'The Insurgency'. Transcript from a TV program of Frontline from February 21, 2006. Retrieved February 22, 2015. ^ a b c d e f g h i j k l m n o Whitlock, Craig (October 3, 2004). "Zarqawi building his own terror network". Pittsburgh Post-Gazette. Archived from the original on October 28, 2005. Retrieved February 27, 2015. ^ a b Bill Roggio (March 30, 2005). "Exodus and Ascent". The Long War Journal. Retrieved February 24, 2015. ^ "Profile of Abu Musab al-Zarqawi". GlobalSecurity. November 1, 2006. Retrieved February 24, 2015. ^ Whitlock, Craig (June 8, 2006). "Al-Zarqawi's Biography". The Washington Post. Retrieved April 23, 2010. ^ Brisard, Jean-Charles (2005). Zarqawi: The New Face of Al Qaeda. Other Press. p. 124. ^ Ghayshan, Nabil (September 2, 2003). "Iran Reportedly Rejects Jordanian Demand to Hand Over Al-Zarqawi". Al-Sharq al-Awsat. ^ a b "Al-Qaeda group claims Salim death". BBC News. May 19, 2004. Retrieved December 31, 2014. ^ "US military: Al-Zarqawi was alive after bombing". CNN. June 9, 2006. Retrieved February 24, 2015. ^ "Iraq backs Zarqawi wounded claim". BBC News. May 26, 2005. Retrieved February 23, 2015. ^ "FBI Updates Most Wanted Terrorists and Seeking Information – War on Terrorism Lists" (Press release). FBI. February 24, 2006. Archived from the original on November 14, 2007. ^ BRIAN ROSS (September 24, 2004). "Tracking Abu Musab Al-Zarqawi". ABC News. ^ "Zarqawi's wife says she urged him to leave Iraq". USA Today. June 7, 2006. ^ a b c Napoleoni, Loretta (November 11, 2005). "The Myth of Zarqawi". Time. Archived from the original on June 21, 2006. Retrieved June 20, 2006. ^ MacLeod, Scott; Bill Powell (June 11, 2006). "How They Killed Him". Time. Archived from the original on June 14, 2006. Retrieved June 20, 2006. ^ "Al-Zarqawi's Legacy Haunts the al-Khalayleh Clan". Jamestown Foundation. June 13, 2006. Archived from the original on March 7, 2008. ^ "Zarqawi — the link between Pakistani and Iraqi militants". Dawn. November 23, 2014. Retrieved February 24, 2015. ^ "Jamaat al-Tawhid wa'l-Jihad / Unity and Jihad Group". GlobalSecurity.org. ^ "Profile: Abu Musab al-Zarqawi". BBC News. November 10, 2005. Archived from the original on June 15, 2006. Retrieved March 1, 2015. ^ Blum, William (May 21, 2005). "The American Myth Industry". CounterPunch. Archived from the original on May 23, 2005. ^ Jones, Gareth (May 4, 2004). "Sixteen held as police 'foil plot aimed at NATO summit'". The Scotsman. Edinburgh. Archived from the original on December 27, 2005. ^ "Jordan says major al Qaeda plot disrupted". CNN. April 26, 2004. ^ "Jordan Airs Confessions of Suspected Terrorists". Fox News. Associated Press. April 27, 2004. Archived from the original on April 21, 2006. ^ "Jordan Sentences Zarqawi To Death". CBS News. February 15, 2006. ^ Hayes, Stephen (June 19, 2006). "What Zarqawi—and al Qaeda—were up to before the Iraq war". The Weekly Standard. Archived from the original on September 30, 2007. ^ "Zarqawi set up Iraq sleeper cells: UK report". Associated Press. July 15, 2004. Archived from the original on March 16, 2005. ^ a b Sperry, Paul (June 14, 2006). "Stephen Hayes, Call Your Editor". Anti War. ^ Napoleoni, Loretta (2004). Terror Incorporated. Seven Stories Press. ISBN 9781583226735. ^ Napoleoni, Loretta. "The Myth of Zarqawi". Anti War. ^ "Beheaded man's father: Revenge breeds revenge". CNN. June 8, 2006. ^ Miklaszewski, Jim (March 2, 2004). "With Tuesday's attacks, Abu Musab Zarqawi, a Jordanian militant with ties to al-Qaida, is now blamed for more than 700 terrorist killings in Iraq". NBC News. Archived from the original on February 10, 2007. ^ "Foreign Terrorist Organization: Designation of Jama?at al-Tawhid wa?al-Jihad and Aliases" (Press release). U.S. Department of State. October 15, 2004. Archived from the original on April 20, 2006. Retrieved April 21, 2006. ^ "The Death of Zarqawi: A Major Victory in the War on Terrorism". The Heritage foundation. June 8, 2006. Archived from the original on March 11, 2010. ^ Ensor and McIntyre, David and James (October 13, 2005). "Al Qaeda in Iraq: Letter to al-Zarqawi a fake". CNN. Archived from the original on October 15, 2005. ^ "New ops planned in wake of Zarqawi hunt". United Press International. June 9, 2006. Archived from the original on June 4, 2013. ^ "Purported al-Zarqawi tape: Democracy a lie". CNN. January 23, 2005. ^ "'Zarqawi' shows face in new video". BBC News. April 25, 2006. ^ a b Soriano, Cesar (June 15, 2006). "Iraqi leaders: Memo details al-Qaeda plans". USA Today. Retrieved June 20, 2006. ^ "After Zarqawi" (PDF). Brian Fishman. June 15, 2006. Archived from the original (PDF) on November 2, 2006. Retrieved June 20, 2006. ^ Karen DeYoung and Walter Pincus (June 10, 2006). "Zarqawi Helped U.S. Argument That Al-Qaeda Network Was in Iraq". The Washington Post. ^ Craig Whitlock (June 10, 2006). "Death Could Shake Al-Qaeda In Iraq and Around the World". The Washington Post. ^ "Saudi Al-Qaeda Terrorists Recount Their Experiences in Afghanistan on Saudi TV and Arab Channels". MEMRI. December 7, 2005. Archived from the original on December 13, 2005. ^ a b Craig Whitlock (September 27, 2004). "Grisly Path to Power In Iraq's Insurgency: Zarqawi Emerges as Al Qaeda Rival, Ally". The Washington Post. ^ a b c d Craig Whitlock (June 10, 2006). "Death Could Shake Al-Qaeda In Iraq and Around the World". The Washington Post. ^ George Tenet. "At the Center of the Storm: My years at the CIA". HarperCollins. p. 157. ^ a b George Tenet. "At the Center of the Storm: My years at the CIA". HarperCollins. p. 351. ^ a b c Gary Gambill (December 16, 2004). "ABU MUSAB AL-ZARQAWI: A BIOGRAPHICAL SKETCH". The Jamestown Foundation. Archived from the original on September 30, 2007. Retrieved October 22, 2009. ^ "Total war: Inside the new Al-Qaeda". Middle East Online. March 3, 2006. Archived from the original on December 11, 2006. Retrieved December 16, 2006. ^ Gilmore, Grainne (February 26, 2006). "Total war: Inside the new Al-Qaeda". The Sunday Times. London. ^ Walter Pincus (October 19, 2004). "Zarqawi Is Said to Swear Allegiance to Bin Laden". The Washington Post. ^ "Letter from Zarqawi to bin Laden". January 2004. Archived from the original on January 20, 2016. ^ Translation by Jeffrey Pool (December 16, 2004). "Zarqawi's Pledge of Allegiance to Al-Qaeda: from Mu'asker Al-Battar, Issue 21". The Jamestown Foundation. Archived from the original on December 29, 2007. ^ "Purported bin Laden tape endorses al-Zarqawi". CNN. December 27, 2004. ^ Ed Henry and Elaine Quijano (May 23, 2007). "Bush uses bin Laden to defend Iraq war policy". CNN. ^ Paul Wilkinson (June 10, 2006). "Zarqawi's Death and the Iraqi Insurgency". NPR. ^ Michael Isikoff and Mark Hosenball (June 23, 2004). "The World's Most Dangerous Terrorist: Who is Abu Mussab al-Zarqawi? And why are so many governments scared to death of him?". Newsweek. Archived from the original on April 16, 2007. ^ "Declassified Key Judgments of the National Intelligence Estimate "Trends in Global Terrorism: Implications for the United States" dated April 2006" (PDF). Archived from the original (PDF) on September 30, 2006. ^ "U.S. Secretary of State Colin Powell Addresses the U.N. Security Council". The White House. February 5, 2003. ^ a b Craig Whitlock (June 8, 2006). "Al-Zarqawi's Biography". The Washington Post. ^ "Saddam refused to hand Zarqawi to Jordan: King Abdullah". Khaleej Times Online. May 19, 2005. Archived from the original on May 23, 2005. ^ Mary Ann Weaver, "Inventing al-Zarqawi", p. 96. ^ Voices of the New Arab Public: Iraq, Al-Jazeera, and Middle East Politics Today. Columbia University Press. 2006. p. 74. ISBN 9780231134484. Retrieved July 18, 2010. ^ "CIA report finds no Zarqawi-Saddam link". Reuters. October 6, 2004. Archived from the original on November 8, 2006. ^ Warren P. Strobel, Jonathan S. Landay and John Walcott (October 5, 2004). "CIA Review Finds No Evidence Saddam Had Ties to Islamic Terrorists". Knight-Ridder. Archived from the original on August 3, 2009. ^ "Detainee Debriefings – Comments on the Relationship". ^ Stephen F. Hayes (November 24, 2003). "Case Closed". The Weekly Standard. ^ Michael Isikoff and Mark Hosenball (November 19, 2003). "Case Decidedly Not Closed". Newsweek. Archived from the original on July 9, 2008. ^ "Saddam Hussein's Support for Terror—regardless of the Senate Intel. Cmte. Report". Archived from the original on March 4, 2016. ^ Michael Isikoff and Mark Hosenball (October 26, 2005). "Fabricated Links?". Newsweek. Archived from the original on November 15, 2007. ^ "Operation Iraqi Freedom document (PDF)" (PDF). Archived from the original (PDF) on October 12, 2006. ^ "Operation Iraqi Freedom document (PDF)" (PDF). Archived from the original (PDF) on November 2, 2006. ^ "Did Russian Ambassador Give Saddam the U.S. War Plan? ("Al Qaeda Presence in Iraq")". ABC News. March 23, 2006. ^ George Tenet. "At the Center of the Storm: My years at the CIA". HarperCollins. p. 341. ^ a b Cambanis, Thanassis (October 3, 2015). "Book Review. 'Black Flags: The Rise of ISIS' by Joby Warrick". Boston Globe. Retrieved October 29, 2015. ^ Ignatius, David (October 2015). "How ISIS Spread in the Middle East". The Atlantic. Retrieved October 29, 2015. ^ "The al-Zarqawi Assessment: Another Instance of 'Cooked' Intelligence?". The Commonwealth Institute. 2004. Archived from the original on June 7, 2006. Retrieved June 9, 2006. ^ Brecher, Gary (2005). "Mister Big Unplugged No. 215". eXile. Retrieved June 9, 2006. ^ Blomfield, Adrian (April 10, 2006). "How US fuelled myth of Zarqawi the mastermind". Daily Telegraph. London. Archived from the original on April 22, 2008. ^ "Abu Musab al-Zarqawi". The Daily Telegraph. London. June 9, 2006. Archived from the original on March 7, 2008. Retrieved June 20, 2006. ^ "SD110006". MEMRI. Archived from the original on February 24, 2006. Retrieved July 18, 2010. ^ a b c d Ricks, Thomas (April 9, 2006). "Military Plays Up Role of Zarqawi". The Washington Post. ^ "Zarqawi death has 'little impact'". BBC News. July 4, 2006. ^ Jeffrey Gettleman (June 9, 2006). "Abu Musab al-Zarqawi Lived a Brief, Shadowy Life Replete With Contradictions". The New York Times. ^ Mary Anne Weaver. "The Short, Violent Life of Abu Musab al-Zarqawi". The Atlantic. ^ Jim Miklaszewski (March 2, 2004). "Avoiding attacking suspected terrorist mastermind: Abu Musab Zarqawi blamed for more than 700 killings in Iraq". MSNBC. ^ "Bush turned down chances to kill Zarqawi: Ex-CIA spy". ABC News (Australia). May 2, 2005. Archived from the original on May 2, 2006. ^ "Interview with Lt. General Michael DeLong". June 20, 2006. ^ Bush, George W. (2010). Decision Points. Crown Publishers. pp. 236–237. ^ Reporters, Various (June 15, 2004). "Bush stands by al Qaeda, Saddam link". CNN. Archived from the original on June 15, 2006. Retrieved June 20, 2006. ^ Bush, George W. (October 7, 2002). "President Bush Outlines Iraqi Threat". Whitehouse.gov. Retrieved June 20, 2006. ^ Hirsh, Michael (March 14, 2004). "Terror's Next Stop". Newsweek. Archived from the original on January 5, 2006. ^ "CIA Review Finds No Evidence Saddam Had Ties to Islamic Terrorists". Knight-Ridder. October 6, 2005. Archived from the original on March 6, 2005. ^ Reporters, Various (June 13, 2006). "Autopsy: Bomb Killed Al-Zarqawi". Associated Press. Archived from the original on June 16, 2006. Retrieved June 20, 2006. ^ "Iraq militants claim al-Zarqawi is dead". Associated Press. March 4, 2004. ^ "Abou Moussab Al-Zarkaoui est mort. Son nom est utilisé par les occupants pour rester en Irak". Le Monde. September 17, 2005. Archived from the original on December 18, 2012. ^ Knickmeyer, Ellen (May 26, 2005). "Reports: Zarqawi Shot in Lung". The Washington Post. Retrieved July 18, 2010. ^ "Cleric says al-Zarqawi died long ago". Al Jazeera. September 17, 2005. Retrieved October 22, 2009. ^ "Report: al-Zarqawi may have been killed in Mosul". The Jerusalem Post. November 20, 2005. ^ "DEBKAfile - DEBKAfile Exclusive: US forensic experts should know by Tuesday afternoon, Nov. 22, the identities of the eight high-ranking al Qaeda leaders who blew themselves up in Mosul to escape US capture". November 13, 2008. Archived from the original on November 13, 2008. ^ "Al-Zarqawi tried to flee in dying moments". msnbc.com. June 10, 2006. Retrieved November 1, 2017. ^ "Official: Al-Zarqawi caught, released". CNN. December 15, 2005. ^ "Iraq Terror Chief Killed In Airstrike". CBS News. June 8, 2006. ^ Knickmeyer, Ellen; Finer, Jonathan (June 8, 2006). "Insurgent Leader Al-Zarqawi Killed in Iraq". The Washington Post. Retrieved July 3, 2011. ^ "Tucson Raytheon had role in al-Zarqawi death". Arizona Daily Star. June 9, 2006. Archived from the original on January 18, 2010. ^ "Iraq terrorist leader Zarqawi 'eliminated'". The Guardian. London. June 21, 2005. ^ a b "Abu Musab al-Zarqawi killed in air raid". Associated Press. June 8, 2006. Archived from the original on June 15, 2006. ^ "Iraqi PM confirms Zarqawi death". CNN. June 8, 2006. Archived from the original on June 13, 2006. Retrieved June 8, 2006. ^ "Zarqawi killed in Iraq air raid". BBC News. June 8, 2006. ^ a b c McIntyre, Jamie; Starr, Barbara; Schuster, Henry; Habib, Randa (June 8, 2006). "'Painstaking' operation led to al-Zarqawi". CNN. Retrieved December 12, 2016. ^ "Was Al-Zarqawi Beaten After Bombing?". CBS News. June 10, 2006. ^ "Military revises al-Zarqawi account". USA Today. June 10, 2006. ^ "Zarqawi 'died of blast injuries'". BBC News. June 15, 2006. Retrieved June 18, 2006. ^ Ververs, Vaughn (June 12, 2006). "There Are Two Sides To Some of the Stories That Pictures Can Tell". CBS News. Archived from the original on June 18, 2006. Retrieved June 20, 2006. ^ Kennicott, Philip (June 8, 2005). "A Chilling Portrait, Unsuitably Framed". The Washington Post. Retrieved June 14, 2005. ^ "World Reaction: 'This Is An Important Day'" (in Arabic). Sky News. June 8, 2005. Archived from the original on November 16, 2018. Retrieved January 11, 2009. ^ "President: 'This violent man will never murder again'". USA Today. June 8, 2005. Retrieved January 10, 2009. ^ "Abu Musab Al-Zarqawi Killed in Air Raid". Associated Press. June 8, 2006. Archived from the original on May 16, 2008. ^ "Qaeda in Iraq confirms Zarqawi's death – Web site". Reuters. June 8, 2006. Archived from the original on June 30, 2006. ^ Gordon, Craig (June 9, 2006). "Death of a Terrorist Leader / HOW AIDE'S BETRAYAL DOOMED AL-ZARQAWI / HOW THEY GOT HIM: Inside tip identified his spiritual adviser, who unwittingly aided search". SF Gate. Retrieved December 12, 2016. ^ "Al-Qaida likely to alter marketing efforts". Associated Press. June 9, 2006. Archived from the original on June 21, 2006. ^ "Al-Qaeda No. 2 mentions al-Zarqawi's death". USA Today. Associated Press. June 24, 2006. Retrieved April 23, 2010. ^ "Tape: Bin Laden tells Sunnis to fight Shiites in Iraq". CNN. July 1, 2006. ^ "Bin Laden recording praises al-Zarqawi". itv.com. June 30, 2005. Archived from the original on March 7, 2008. ^ "Zarqawi Scheduled for Martyrdom". StrategyPage. June 8, 2006. ^ "U.S. Moves to Stop Zarqawi Network in Iraq". Associated Press. June 9, 2006. Archived from the original on June 13, 2006. ^ "Reward for al-Zarqawi will be honored". Associated Press. June 8, 2006. Archived from the original on January 28, 2013. ^ Lake, Eli (June 14, 2006). "Forces Asked That Price on Zarqawi's Head Be Reduced". The New York Sun. p. 2. ^ "U.S. reveals face of alleged new terror chief". CNN. June 15, 2006. ^ Nelson, Fraser (June 11, 2006). "Death of Zarqawi is a mere sideshow". Edinburgh: Scotland on Sunday. Archived from the original on May 22, 2007. ^ "Iraq Coalition Casualty Count". icasualties.org. Archived from the original on November 14, 2006. Retrieved November 12, 2006. Brisard, Jean-Charles; Martinez, Damien (2005). Zarqaoui : le nouveau visage d'al-Qaïda (in French). Fayard. Kepel, Gilles (2005). Al-Qaida dans le texte : écrits d'Oussama ben Laden, Abdallah Azzam, Ayman al-Zawahiri et Abou Moussab al-Zarqawi (in French). Paris, France: Presses universitaires de France (PUF). ISBN 9782130561514. Milelli, Jean-Pierre (2005). La lettre d'al-Zarqaoui à Ben Laden (in French). Paris, France: Choiseul.